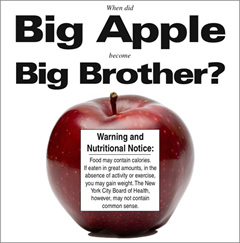 The Center for Consumer Freedom, an advocacy group funded by food corporations, released this ad decrying the New York City Department of Health's attitude towards junk food by asking "When did the Big Apple become Big Brother?" 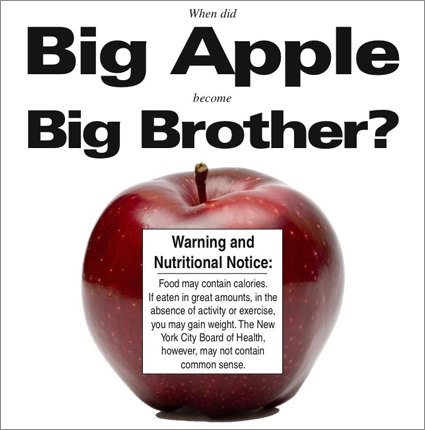 It's largely in response to the New York City DOH's recent demonizing of sugary drinks by running gruesome posters that depicted human fat pouring out of soda bottles. 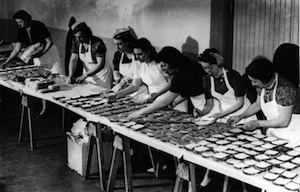 It's part of a larger $1 million ad campaign to defend high fructose corn syrup called Sweet Scam — the website offers a myths/facts section — including this commercial that puts three sweeteners (sugar, high fructose corn syrup, and honey) on a police lineup, asking a man "Do you see the one responsible for you gaining the weight?" Protecting me from "scientifically-proven to be harmful to my body" food - NYC DOH. The Center for Consumer Freedom is really no different than the Competitive Enterprise Institute. It's a good thing we have this guy in office.